LaLa Gifts Hamper Online Shop can give you a happy experience for online shopping. Ordering our gift hamper, and it only takes a few minutes to complete the process. LaLa Gifts has a service hotline can answer any questions you may have. Firstly, you can take a look at our splendid gift hamper or flower bouquet and make a selection based on your needs. you will see the page of "Delivery District" for select the delivery address. If you want to order other gifts hamper, you can click the "LaLa" logo which show on the top of the website. And choose other gifts to add to chat follow the order step as show as above. After that, you will see a page of "Delivery District" for select the delivery address. 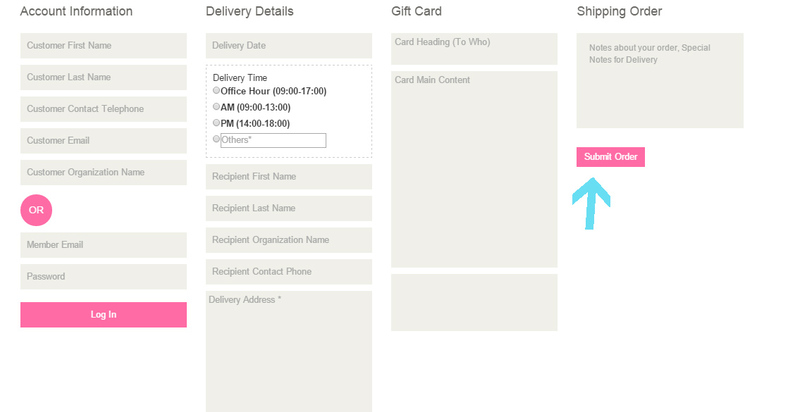 And then you can click the "Submit Order" when you finish some order information. you will be able to checkout and pay for your purchase. As you can see, ordering your gift hamper is easy and takes just a few minutes. We know that you will find the gift your loved one will simply adore.